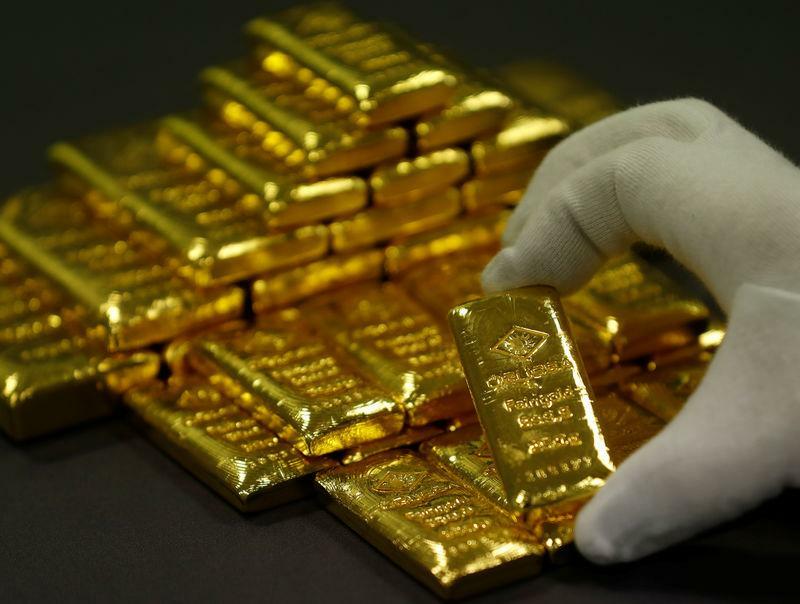 NEW YORK/LONDON (Reuters) - Gold prices fell more than 1 percent on Friday as the dollar firmed against the British sterling and the euro after British Prime Minister Theresa May said the European Union must supply an alternative Brexit proposal. China's moves to boost domestic consumption also helped bolster the dollar rally driven by investor bets that the latest U.S.-China trade salvoes were unlikely to dent global growth. The dollar's status as the chief reserve currency makes it the prime beneficiary of U.S.-China trade conflict, with the United States seen as having less to lose. "A big selloff in the pound and euro sent the dollar sharply higher. And gold, being dollar-denominated, fell as a result of that," said FOREX.com analyst Fawad Razaqzada. Spot gold lost 0.8 percent at $1,196.86 per ounce by 1:35 p.m. EDT (1735 GMT). During the session it touched its lowest since Sept 11 at $1,191.51. However, gold headed for a 0.4 percent weekly increase. U.S. gold futures for December delivery settled down $10, or 0.8 percent, at $1,201.30 per ounce. The euro and the pound fell after British Prime Minister Theresa May said the European Union must come up with an alternative to her Brexit proposals, saying talks had reached an impasse after the bloc's leaders rejected her plans without explaining why. Investors await next week's Federal Reserve meeting, where the U.S. central bank is widely expected to raise benchmark interest rates. Higher U.S. interest rates tend to make gold less attractive since it does not pay interest and costs money to store and insure. In other precious metals, spot silver rose 0.1 percent at $14.29 an ounce, after rising to two-week highs of $14.43. "The factors driving silver are much more industrial-related," said Maxwell Gold, director of investment strategy at Aberdeen Standard Investments' ETF Securities. Silver is closing the week up about 2 percent. Palladium touched its highest since April 19 at $1,056.72 per ounce before retracing gains to trade about flat on the day but with a weekly rise of more than 7 percent, the biggest weekly percentage gain since April. Platinum fell 0.4 percent at $828.70 after hitting its highest since Aug. 9 at $838.40. The metal is closing the week more than 4 percent higher, the strongest weekly gain since January.